The concept was to build a fully microcoded machine that would emulate the B6000 and B7000 series mainframe architecture. There were slight differences between the B6700, the B6800 and the up coming B6900, not to mention the B7700 and B7800 mainframes. We needed to consolidate the instruction set so that future compatibility would be assured. John McClintock assigned Bill Ellis, a sharp Operating System programmer with a lot of experience porting the MCP from the B6700 to the B6800, and working with Paoli, PA on the B7700 differences. We told John McClintock and Ron Tucker that we needed to be away from the plant to get this done. We could not have any interruption if we were to pull it all together. In early November of 1977 Ron Delaura and Don Swanson gave use the go ahead to work on the ELS (later called the B5900) proposal. Bill and I spent the next two weeks at his house in Mission Viejo, pounding out a spec for what was to become E-mode and the register level architecture of the ELS, later called the B5900 (from now on I will use the name B5900, although the machine was called the ELS during this period). I had a pretty good idea of what would work well for a VLW emulator, and he knew what was needed to maintain software compatibility. Up until then there were narrative descriptions of the E-mode instruction set, we expanded on those, but we also transformed them into an Algol like description. Actually we used a meta-language to describe rigorously what the instruction set did. The Algol-APL like meta-language blend would later become the language we used to generate the microcode for the B5900. 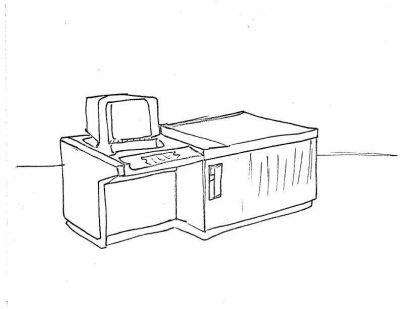 One of the competitive challenges for the B5900 was that it would be a direct competitor with the Burroughs Pasadena machines which were excellent COBOL machines. The Mission Viejo software department wanted to add several instructions to E-mode that would allow it to be more efficient at executing COBOL. Bill and I had several meetings with compiler writers, including a senior compiler writer who worked on COBOL. The net result was we added some new instructions to help the B5900 execute COBOL. When Bill Ellis and I returned to the plant in December 1977, we presented the E-mode specification and B5900 hardware architecture to Ron Tucker and John McClintock. They loved it, Ron for the simple, elegant design of the hardware, John for the first clear description of the stack architecture. Together these documents would form the basis for all future hardware and firmware implementations of the Burroughs large systems. After design reviews in both the hardware and software departments, the specs were signed off. I worked on the Entry Level System proposal, which was presented to Erv at the end of January 1978. After Erv’s approval, I wrote the first PDA for the ELS (B5900) which I completed at the beginning of March, 1978 (Allweiss, J. 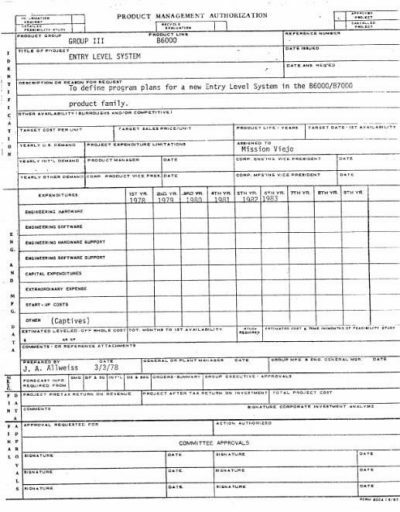 “Entry Level System PDA”, internal Burroughs document, 3/3/1978). Since we knew this PDA could not be approved by Detroit, it was approved internal to the Mission Viejo plant. The PDA called for design to begin in March of 1978, and complete by December 1978. I originally proposed that the first ELS B5900 would ship in December of 1979, but Erv said funding would not be available for that, and it conflicted with the B6900 schedule. The first ship date was pushed back to second quarter 1980. It was time to get to work. Bill’s group would develop a compiler that would transform the meta-language descriptions in E-mode to actual VLW instructions that ran on the B5900 hardware. Bill would use the compiler to generate the E-mode microcode. My group would design the hardware. Ron made me a section manager, and gave me four engineers, Dave Matty, Cas Pencak, Dave Eaves, and Al Regalado. It was now June of 1978.